After such a jam packed weekend last week, this past weekend was a rather lazy one. I wasn't well and Jesse was heading off to Canberra to work for the week on Sunday afternoon so we decided to soak up as much together time as possible and do absolutely nothing. Nothing that is except eat pancakes, watch movies and laze about in warm and comfy clothes - our idea of the perfect lazy weekend. Pancakes have to be one of my favourite meals ever and I think they're the ultimate weekend treat. Whilst we have a million and one pancake recipes that we use, we're always coming up with new ideas and trying different combinations. 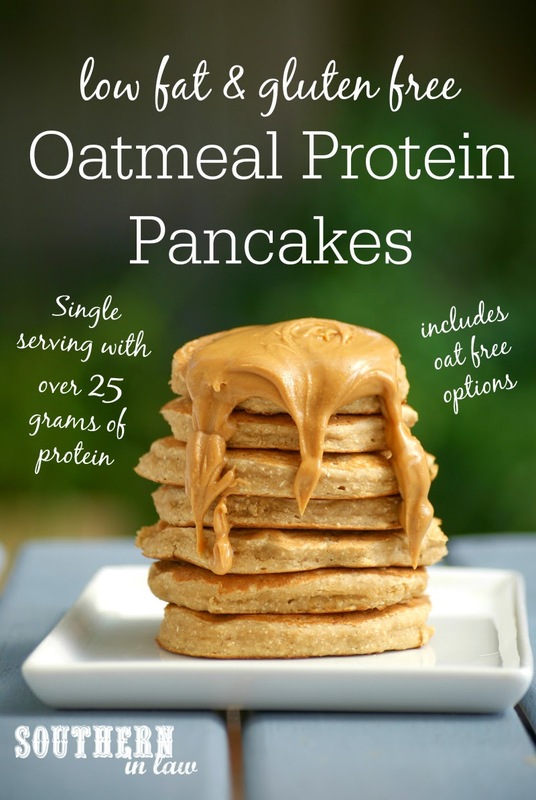 Lately we've been adding a protein punch to our pancakes stacks with these Oatmeal Protien Pancakes - and they are so ridiculously delicious we've been whipping up at least a batch a week. They're super thick and fluffy and so easy to make your own. Mix through some chocolate chips or juicy blueberries. Add in some thick banana slices for thick, caramelised banana pancakes. Switch it up with your favourite flavour protein powder. 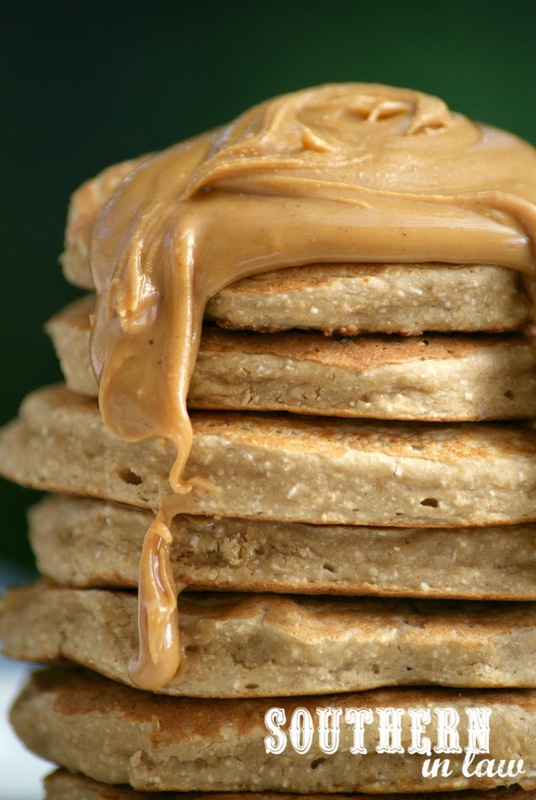 Make them into peanut butter pancakes by switching protein powder for peanut flour. Pimp your pancakes with whatever toppings tickle your fancy. The possibilities are endless because this is the perfect base recipe! Jesse and I both tend to go our own route when it comes to the toppings. I'm the peanut butter queen who hassssssssss to top her pancakes with an abundance of thick, stick-to-your-mouth peanut butter whilst Jesse prefers to keep it traditional with butter and syrup. Whatever your toppings or mix ins, you'll have a perfect single serve stack with a whopping 25 grams of protein in just a few minutes. Combine all of your pancake ingredients in a small mixing bowl, adding in any mix ins/additional sweetener if you prefer. Cook your pancakes in a non-stick pan over a medium-low heat, flipping once the bottom of your pancakes is golden and the top is set and then cooking until your pancakes have cooked through completely. It's best to keep the heat low and cook them low and slow to ensure you don't end up with doughy or burnt pancakes. Repeat until all of your pancakes are cooked, top with whatever toppings you desire and devour! 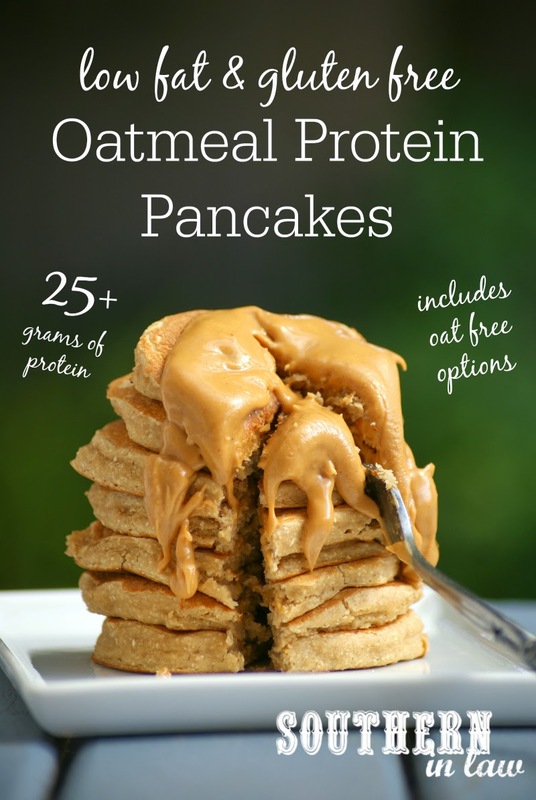 These pancakes also freeze really well - make up a big batch and freeze stacks in individual ziplock bags for a quick and easy protein packed breakfast option! *If you can't eat oats or don't like them, feel free to substitute them with 1/3 cup of any flour of your choosing (with the exception of coconut flour as that will make crumbly, dry pancakes - stay tuned for a coconut flour pancake recipe!). We like using buckwheat flour, quinoa flour, brown rice flour or gluten free plain flour. Find out more aboutoats on a gluten free diet here. **We've tried this recipe with a variety of different protein powders and all worked perfectly. Try it out with your favourite type/flavour and let us know how it went! We use this unsweetened brown rice protein powder, however, if you have a sweetened protein powder you may find that you don't need to use as much maple syrup/vanilla. For an all-natural protein packed breakfast, try replacing the protein powder with peanut flour for delicious peanut butter pancakes! But tell me, what does your ultimate lazy weekend look like? Favorite meal ever, yes yes! <3 I love my Sundays! After a crazy good workout all morning, I'm also nice and tired (in a good way) the rest of the say and I feel so productive, but just sit and blog, read, cook, etc.! It;s great! That peanut butter drizzle topping looks insane! 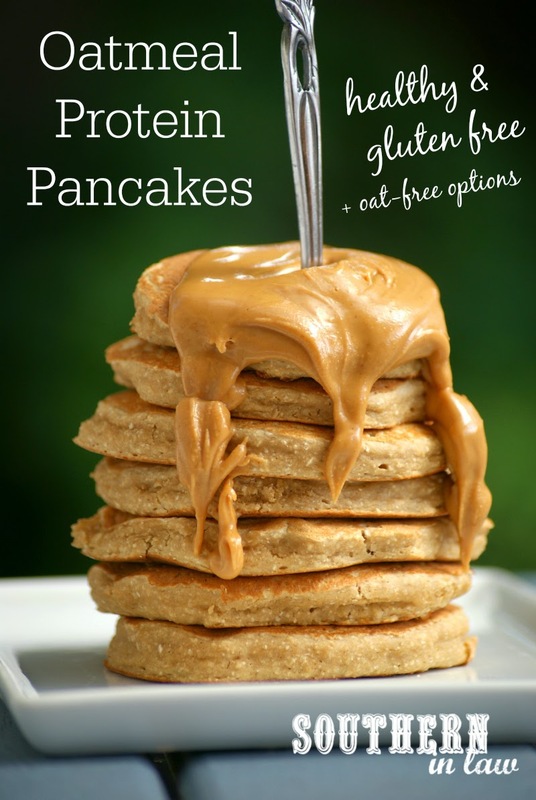 Thanks for sharing- I'm always looking for awesome g-free pancake recipes. Do you think these would turnout good as pancake muffins? Hey Kristi, they sure would! Just bake them in a muffin tin of your choice at 180C/355F. Keeping an eye on them and taking them out once cooked through. Mini muffins would probably take 10-15 minutes whilst full sized muffins would take around 15-25 minutes, depending on the size and thickness!